Ground Plane colinear dual-band antenna for base station service working on the radio-amateur frequency of 2m/70cm. The radial whip is of brass inserted in a conic fiberglass tube for a perfect protection from the worst climates and the radials are of stainless steel to get the maximun strength. 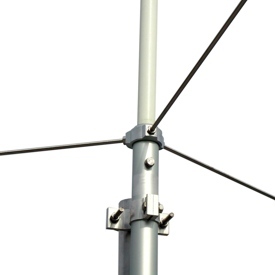 They are supplied with a solid aluminium bracket for an easy installation on the support mast.